I have been unable to see the episode of "Between the Lines" with Barry Kibrick in which he interviews the author of this book, Austin Washington. Mr. Washington is the great great great etc grand-nephew of George Washington; as in the Father of Our Country. As such, he has a unique perspective on the story of the man and how he really willed himself to be what he became. Get ready for the best book ever written about the Father of Our Country. What makes this book so special? It was written by his great nephew several times removed, Austin Washington. He is the direct descendant of one of George Washington’s brothers. He was even raised in one of the homes owned by the Washington family since colonial times. It was in the kitchen of that house where he first encountered the great man’s portrait; noticeably smaller than that of his 2 brothers; in the kitchen. The other 2 portraits were displayed more prominently elsewhere. The premise of this book stems from an old miniature biography of Frederick, Duke of Schonberg; called a Panegyrick; that was published in 1690 and fell into young George’s hands sometime during his early years. Most people assume that Washington was at least as educated as his colleagues Jefferson and Adams. But that would be wrong. Although his 2 brothers received the benefits of his father’s relative wealth; both received classical educations; young George was unable to take advantage of this attribute due to his father having passed away when the boy was only 11 years old. He would have to study at a local school, which would not afford him the same type of education as his peers in later life possessed. Washington did not quote the Greek scholars so highly thought of by men like Adams and Jefferson. To him Greek was; well, Greek. But the biography of Schonberg was a book which he studied and took to heart; and whose subject he tried to emulate in every way possible. Some might say he surpassed his idol in all respects; after all, until I read the man’s name, I had never heard of him. And I doubt you have either. 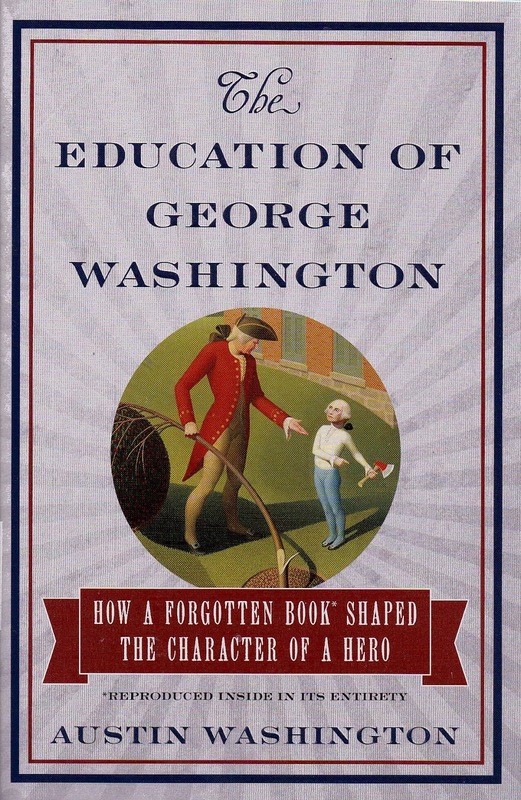 Drawing upon family history; as well as some of Washington’s lesser known writings; the author successfully debunks the myth busters on several of the most apocryphal stories about Washington; stories we were told about in Kindergarten, and then later on debunked by our high school teachers. Some of the stories in this book are so wonderful in their original, true versions that you have to wonder why Reverend Weems; Washington’s local pastor; found a need to embellish them in the first place. The Cherry Tree – it really did happen, but not like you heard. Little George did kill the tree, he just didn’t chop it down. This is the only case in which I will tell you what the book says. I want you to read the book on your own. Besides, I’m no spoiler. George’s father had a favorite cherry tree; it was his pride. George was about 6 years old at the time and his father presented him with a hatchet. He took that hatchet and chipped away at everything he could find. When it came to the fabled cherry tree he merely skinned it of its bark. When the tree began to fail and the elder Washington noticed the bark skinned from the trunk, he inquired of the whole family as to who had done it; knowing all the while that it was George. The boy actually did say he could not lie to his father and owned up to the deed. His father expressed that he would not trade 100 trees for his son’s integrity. That’s the true story. The silver dollar across the Potomac is a similar circumstance. Washington was a very strong and athletic young man. His feats of strength almost rival those of Abraham Lincoln’s. Young George had an arm which rivaled that of famed Washington Senator’s pitcher Walter Johnson; who in 1936 actually did pitch a silver dollar across the 272 foot width of the Rappahannock, clearing it by an additional 42 feet beyond the far bank. If you want to know how this relates to the Potomac story; read the book. His father was a very big influence upon young George; but you have to wonder how he would have developed had his father not passed away when he was so young. Most likely he would have gone on to the better schools over in England; as was the family plan. Had that occurred he would have been in a much different situation when it comes to any revolutionary ambitions. This is a long overdue book which will hopefully set the record straight once and for all about the Father of Our Country. The timing couldn’t be better; it was just released late in January and it is already in the library in time for Washington’s traditional birthday; which is of course today. The change in the calendar from the old style to the new in the 1740’s make Washington’s Birthday even more complicated than the ubiquitous “President’s Day holiday, which changes every year to accommodate convenience. Washington was actually born on February 11th on the old calendar. When the change to the calendar came it added 11 days to his date of birth. Don’t discount this fascinating book by George Washington’s great grand-nephew. It is filled with wit and wisdom, displaying a keen sense of humor as it sets about to correct the record concerning the most well-known; and some not so; stories about his life. It also illustrates how one little book; which is reprinted in the back of this one; can alter a person's life, and affect millions in the bargain. Very well done.